The Red Line is a 7-mile stretch of light rail in Houston, Texas, that includes a high number of rail-highway crossings. A number of crashes have occurred on the Red Line involving cars and light-rail vehicles, with one crash resulting in a fatality. One potential cause of crashes is motorist's lack of compliance with traffic signals, partially due to limited visibility of those devices. 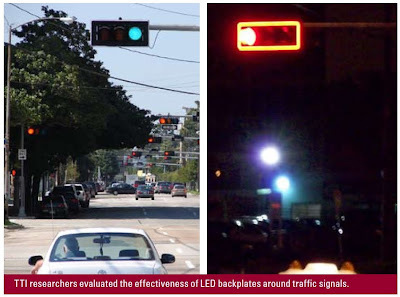 Houston METRO and the Texas Transportation Institute (TTI) are evaluating supplemental treatments to increase visibility at the signals, and hopefully reduce the number and severity of crashes. Though color vision deficiency is not explicitly mentioned in the article, the specific treatments should have a significant effect on colorblind drivers. Light emmitting diode (LED) backplates have been added around the traffic signal heads to increase the conspicuity of the traffic signal. The difference between this application and the reflective backplates discussed on the blog (in Kentucky and Quebec) is that the red outline on the backplate is illuminated only when the traffic signal indication is red. Similarly, a line of LED lights is placed in the pavement in front of the traditional white painted stop bar. The red pavement lights turn on when the traffic signal indication is red, and remain off at all other times. According to the Texas Transportation Research article, early indications show both treatments having a positive effect on motorists. Additional evaluation will be conducted this year before completion of the final report. This is yet another example of a treatment providing a significant benefit to colorblind motorists while also having a positive effect for all other drivers. The illuminated stop bar is now mentioned on this site. I note that the beacons each act like minature level crossing signals. The red illumanted backplate wolud make a great substitute for the reflective white backplates common in the UK, and also in some Australian states such as New South Wales. Agree that red illuminated backplate can be very helpful, though its cost is significantly higher than the typical white reflective backplates in Australia, Europe, and some U.S. states (Washington, Kentucky, Oregon).